This week marks the 8th anniversary of the official start of the invasion of Iraq. As has been noted on this show many times, Iraq had been under fairly constant bombardment for over a decade prior to that date but this was an official declaration of war. Even though it was unconstitutional since Congress did not declare war, the people most affected by the war – Iraqi civilians – don’t much care about the constitutionality of the war and continue to suffer as a result of it. This week also marks the 8th anniversary of The Monitor. Tonight’s guests will be Raed Jarrar and Phyllis Bennis. 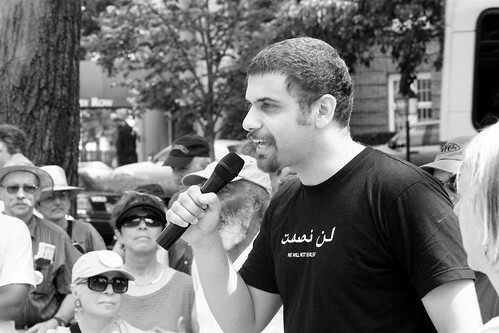 Raed Jarrar is an Iraqi-American blogger and political advocate. He has just returned from his last trip to Iraq last week where he spent a month in Erbil participating in a conference on Iraqi media. Raed Jarrar was born in Iraq, and he was in Baghdad 8 years ago during the US-led invasion. Raed immigrated to the US in 2005. He is joining us from Washington, DC. This entry was posted in Arab World, Iraq, Libya, Pro-Democracy movements in the Arab World, Radio Shows, The New Middle East, UN Resolutions and tagged Iraq, Libya, UN Resolutions.